One evening a month ago we awoke in the middle of the night to our daughter screaming and crying. Typically that signals a bad dream. Not that time though. She was hot to the touch and holding the side of her head. Through the sobs, we heard her say, "My ear hurts really, really bad." We tried to take her temperature with the ear thermometer, but there was no way we were getting near the ear. We calmed her down, gave her some pain medicine, and eventually got her back to sleep. The next morning we sought medical help. It was the weekend so instead of visiting our doctor we unfortunately had to make a trip to immediate care (a.k.a. emergency room in our rural area). Prior to this emergency room visit I signed up for the Exergen TemporalScanner review campaign. Little did I know that I'd get to see the product in action before it was shipped to our home. In the emergency room triage area, the nurse took my daughter's temperature with this very thermometer. Intrigued, I asked her what she thought of the temporal scanner. She replied that at first she was skeptical about the claimed accuracy of the new device. The emergency room conducted their own week long test, comparing results of the TemporalScanner with their standard procedure of taking temperatures. Amazed, they discovered that the thermometer worked as promised and was just as accurate if not more accurate than taking temperatures orally. 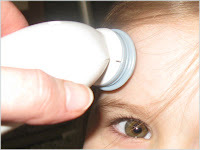 The temporal artery thermometer is now their method of choice for recording temperatures. If the Exergen TemporalScanner is good enough for the emergency room, it is good enough for us! The Exergen TemporalScanner is an infrared thermometer that measures the blood temperature in the temporal artery, a main artery in the forehead. Here's the amazing part -- the sensor accurately measures body temperature to within +0.2ºF! That is a whole lot more accurate than taking the temperature using other means: oral, rectal, under the arm or ear. It is also way less invasive. And, according to the press release it is the only thermometer manufactured in the U.S.
1). Put the thermometer probe on the forehead. 3). Release the button and read the temp. This is a dream thermometer for parents with small children. No discomfort is felt at all during the scan and it just takes seconds. Even my squirmy one-year-old sits still to get his temperature taken! We've used our several times and love it. You can find the thermometer at most major retailers. It sells for around $40-$50, but believe me, it is worth every penny. Currently, a $5 off promotion is underway. Click here to download a TAT-2000C Educational Pamphlet and rebate coupon [pdf]. Win one! Exergen Corporation has kindly offered to give one Brimful Curiosities reader an Exergen TemporalScanner. To enter, visit Exergen.com and leave a comment letting me know why you think you need this thermometer. Thanks to Family Review Network and Exergen Corporation for this review opportunity! I don't think my current digital thermometer is very accurate and this would be so much easier to deal with when the kids are sick. Trying to get to an armpit (our preferred area) isn't always easy when they're all bundled up! Thanks for the review and giveaway! I bought this same scanner on the recommendation of my friend who is an ER nurse and the other ER nurses we saw during my son's visit 2 weeks ago. The ear is not an accurate read. I've been happy with it so far. They also sell it at Costco for about $30-40. I need this because my daughter hates our oral thermometer. I can't blame her, who wants to put that in your mouth when you feel nauseous? Thanks! This is super fast and super easy!! I just Believe in this product! Like the other moms, our thermometer is only accurate part of the time. And with 3 kiddos who pass everything around (to us too!) we are frequently in need of a thermometer... A good reliable one would be nice! I love that this thermometer is used by hospitals! Sells me even more on it! I would love to have this! I am so tired of never getting an accurate reading. This is so non evasive, accurate and easy! Great giveaway. I think I need this because I think it would be a lot more accurate than the thermometer I have now. Having a three year old is the only reason i would ever need for winning this great thermometer! All of our thermometers take FOREVER to get a temp reading, which isn't fun with a 1 1/2 year old~this one sounds like it would be great to have around. wow, this is awsome! i could use this, our under the tounge thermometer isnt so accurate and is old. i hope to win this one. My son never stays still enough to have a true reading! I would love to have this! I'd like to win this to give to my daughter-in-law to use with the kids! I need one of these because I currently use an oral thermometer and this TemporalScanner would be much more accurate and easier to use. I would love to have this because it is faster and more accurate then the thermometer I currently use. I would love to win this because I have a few friends who are pregnant, and I think this would be a great baby shower gift. It's something that is useful - and something that no one else will probably give as a gift too. Well, I'm a PreK teacher, and this would be the PERFECT thermometer to have in my classroom. I need a quick, sanitary way to check my students' temperaure when I suspect they have a fever. Currently, I use an ear thermometer - but I wonder about how sanitary that is even though I do spray it w/ Lysol. This seems like the answer! Super easy to use and it would irritate the kids (they probably won't even realize I'm checking their temp!) What an awesome product! I'm in Wisconsin, too - and this winter's been the worst for fevers at our house! (Maybe all the up and down, rain or snow, who knows sort of weather?? I'd love to be able to take an accurate temp without waking my sleeping kiddos. Thanks! i would lonve to win this because I can't keep her still long enough to take her temp with my ear thermometer. This would make things so much easier. I need this thermometer because it consistently takes accurate temps. I find that "normal" thermometers do not. This thermometer is used in hospitals, that is enough of a recommendation for me! My pediatrician's office uses this as well and it's the only thermometer they recommend. With a newborn and a preschool that refuses to use a traditional thermometer I'd love to win this. Great giveaway! We could definitely use this because my son squirms so much when we try to take his temp (with an oral thermometer). It's such a struggle that I doubt it's ever accurate. I loaned my digital oral thermometer to a friend and did not get it back. I am using an old glass oral one now! This would be great! This would make taking temps so much easier. I really like that the Exergen TemporalScanner gives accurate temp readings while being non-invasive. I currently take my son's temp rectally and as he gets older and doesn't cooperate as much this would be very nice to use! I don't think the under the arm method cuts it. I have 4 kids and someone is always sick in the winter. This would help me take their temperatures easily. I am a new blog and tweet follower. We are getting the nursery prepared as we wait to welcome our miracle through adoption. I have been researching this thermometer and would love to win it. I love this because its non-invasive and accurate, whereas other thermometers are affected by drinking, coughing, talking, etc. I would like to win this thermometer for a different reason. My husband has a high freguency sound loss of hearing. He is unable to hear the digital thermometers that have the beeping sound to let him know when it is working. This look like it would be great for him. Thanks for the chance. I'm having a baby this month and haven't had a good thermometer for years, so I'd love to win this! My daughter likes to wiggle so much that trying to stick a thermometer in her ear just makes us both want to cry. This method seems so much easier. I could even do it while she is asleep. Wonderful idea. I have a little one and this method seems like it would be so much easier than going in either typical end of a child. This looks like a great way to take a temperature. I cannot get my kids to sit long enough to take theirs. I have three small kids who hate regular thermometers. This looks so easy to use when they are sick and irritable. I have 2 kids of my own (3 years and 6months) and I have a daycare in my home during the week. This would be a fast accurate way to check the temps on anyone feeling under the weather. I just had a baby in December and have heard alot about this type of thermometer. I have a digital and always wonder if the temp is accurate. I think the thermoscanner would be so much esier and the most accurate device to use. With two wriggly toddlers, I NEED a noninvasive and fast way to get reliable temperature readings! have teens and older children with grandchildren. My daughter in law is a first time mother and the first month of my grandsons life she took his temp daily. She carries a thermometer in her purse. My daughter who is 17 wants to be a pediatric surgeon and says they learned in her medical skills class that they no longer use rectal or mouth for temps in most medical facilities. So with my grandsons visiting this would be so nice to have at home even my husband could actually read it correctly. I take care of my 90 year old father, so I know that I need this! This is great! Is nice to have with small children that don't like to be still. I need this as I have such a hard time getting an accurate temp on my little one as she is always on the move and doesn't want to sit still for digital thermometers. I just signed up to become a follower! I need and want the exergen temporal scanner so that rectal temps can be a thing of the past. I know Brea will love you forever if we win! Our medically fragile daughter is frequently sick, and it's so nice to be able to quickly take her temp, even when she's sleeping (without waking her up!!). Our previous temporal thermometer just conked out after 3 years of frequent use, so we could really use this. It's definitely more convenient than prodding the poor kid in the rear, the old fashioned way! Talk about unpleasant! It can save trips to the dr. with its accuracy, too. Thanks for the entry! I need this for my son who gets frequent fevers and has experienced and is prone to febrile seizures because of them. I think that I could use this b/c I have an outdated thermometer. With mercury which is bad. Thank you. I purchased one of these 7 years ago. It has been reliable and long lasting but my experience is that you need to take the temp 3 or 4 times and take the mean temp because it changes with each time. I have taken my sons temp and had it read 103, taken it again immediately and it said 100 and then again and it says 98 and then back up to 101 in the space of 2 minutes. It is a quick and easy noninvasive means of taking temp. I bought mine directly from the company when they weere brand new on the market and overall have been pleased but my ear thermometer is much more relaible.